We were blessed with not 1 but 2 beautiful Royal Weddings this year, and Wow We loved them both! 19th MAY 2018 Prince Harry and Meghan Markle became husband and wife in a moving ceremony at Windsor Castle. Finally after months of speculation we got to see “the wedding dress”, how amazing did she look! 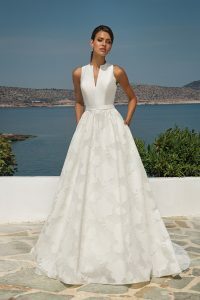 Timeless and elegant spring to mind, totally minimalist, the gown featured a soft boat neckline which framed the shoulders and emphasized the waist and of course there were sleeves!! 12th OCTOBER 2018 Princess Eugenie marries Jack Brooksbank at St George’s Chapel. finally the moment we had all been waiting for, Princess Eugenie stepped out of the car…….WOW We adored her wedding dress, breathtakingly beautiful. The stunning silk jacquard gown featured a stunning portrait neckline and the long flowing train was amazing and of course there were sleeves!! !